The CP-12040 mini redundant power supply employs Hot-Swap module function to maintain utmost system availability and power sharing Features: that extend life of power module. It provides a greatly reliable power solution for compact high performance computing systems. 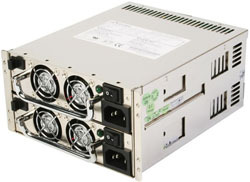 The CP-12040 mini redundant power supply can be installed in a standard ATX case or 4U chassis for wide compatibility and universal standardization. 400+400 watts, 6-output, fan-cooled switching supplies. Note1: Noise bandwidth is from DC to 20MHz. Add 0.1uF/10uF Capacitor at output connector terminals for Ripple And Noise measurement. Note2: Regulation tolerance shall include temperature change, warm up drift and dynamic load. Note3: Combined Total Power from +3.3V and +5V Rails Shall Not Exceed 160W. Note4: The Total Output Power Shall Not exceeds 400W.